Teaching your children how to cook gives them a fantastic life-skill, plus cooking involves lots of nice educational things like maths (weighing, scales, time), science (why is toast so much more yummy than bread?) cultural studies (learning about different traditional recipes from around the world) and social skills (sharing, patience, hygiene). If you teach your young children to love cooking, who knows, they might be serving you dinner every night as teenagers. Now, that is something to aspire to. 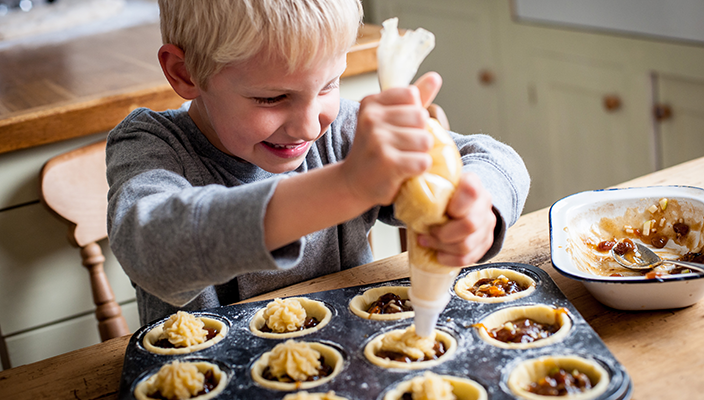 Here are some tips on getting them started: Let your kids into the kitchen! Don’t disappear and cook in private. Lay down some safety rules about the oven, knives, food processor blades and so forth. The first stage in getting your kids interested in the kitchen is to let them into it; allow them to press the mixer button, stir the sauce and lay the table. Some of the earliest kid-friendly recipes are things like dough, biscuits, chocolate crispies and cupcakes. Depending on your tolerance for mess, you can give them their own bowl and ingredients and simply let them play at measuring and stirring. To get into the habit of washing their hands and putting on an apron before they cook. Buy pizza bases or make your own dough and let your kids put their own toppings on. Making smoothies by putting fresh fruit into the blender is a great way to get your child started with thinking creatively about flavours and colours. Allow them to experiment with more unusual additions like a little pinch of cinnamon or ginger so they start to understand spices. Children love getting stuck into butter, flour and sugar to make crumble topping. It’s even better when you’ve been on a blackberry ramble and they see the process from hedgerow to yummy fruit crumble. Fruit and vegetable kebabs are fun to prepare. 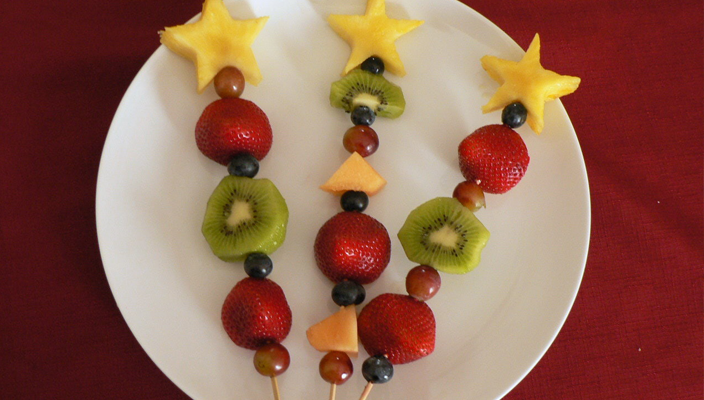 Adults can cut up the fruit and vegetable pieces while children skewer up their favourite combo. Cheese squares are a nice addition too. The toaster is the perfect ‘first’ heating device to introduce kids to before letting them get stuck into oven-based cooking. Toasting bread, muffins and crumpets is fun and a perfect opportunity to teach children about toaster safety. Kids love watching butter melt into the warm breads afterwards. Why not lay out some small pots of different spreads and let them try different toppings. The first thing my mum taught me how to make was French Dressing for salads and I used to love being called upon to conjure it up every time we had a salad. Take an old jam jar with a lid. Put in about 3cms of olive oil and 1 cm of balsamic, red or white wine vinegar. Add a generous pinch of salt and pepper. Add a tsp of mustard – any will do but my favourite is Dijon Add a 1/2 tsp of sugar Place the lid on the jar and shake until all ingredients are thoroughly mixed. Taste and add seasoning to get the desired flavour and voila! 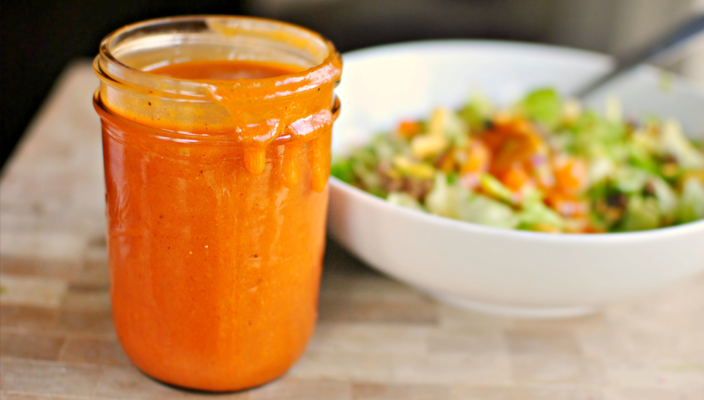 French Dressing. Finally, don’t forget to teach kids about washing up afterwards! Although they might not be so keen on that bit… Do you have any tips on teaching kids how to cook? 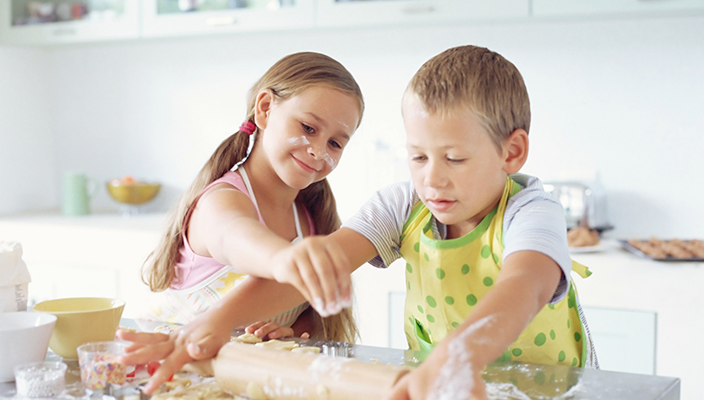 Cooking With Kids: Do Your Kids Love Being In The Kitchen?